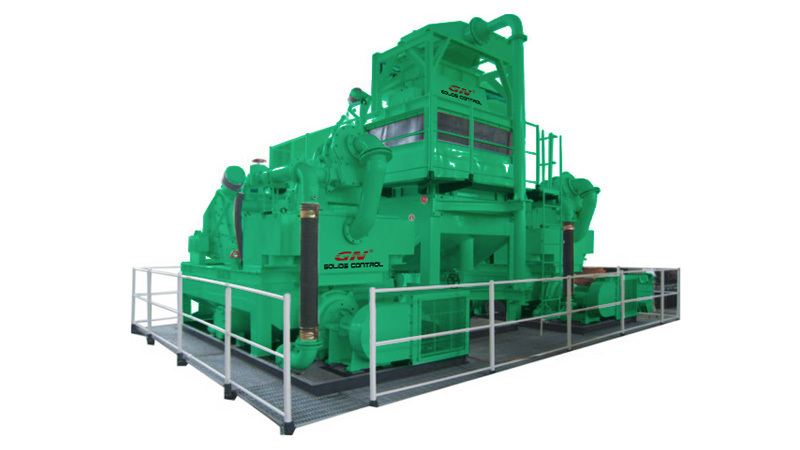 GN solids control recent shipment news: Australia drilling company 400bbl mud tank system. This is a customized design mud tank system for Australia drilling company. 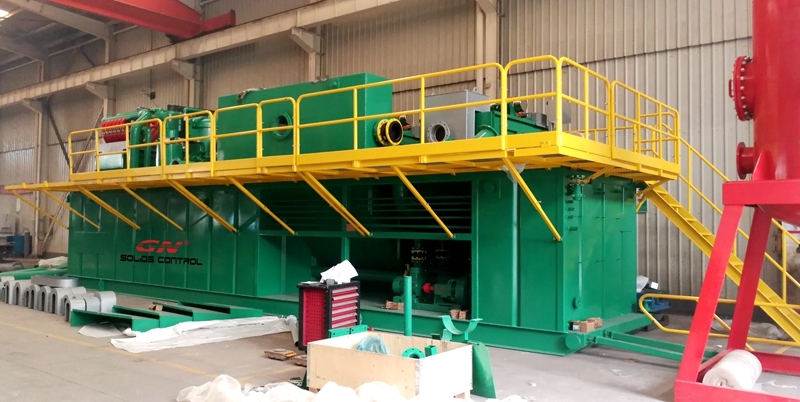 It consists of 2 mud tanks, 2 units of linear motion shale shaker, and single skid mounted jet mud mixer for mixing. Each mud tank with 200bbl capacity, total 400bbl capacity, each mud tank with mud agitator, mud gun, man hole, clean gate, hand rails, walkway, stairs, pipelines, etc. The shale shaker is GNZS703F-HB , the best sold model among all the shale shaker models. The shaker screen area is total 2.63m2 for 3 panels, each screen dimension is 700x1250mm, the composite material shaker screens ensure the working life and separation performance and can effectively avoid the screen blocking and overflow. 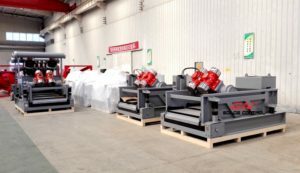 The linear motion shale shaker with high G force with adjustable G up to 7.5, the vibration motor is made of Italy Oil brand vibration motor, the fluids touch part of the shaker deck bottom plate is made of stainless steel for anti-corrosion. 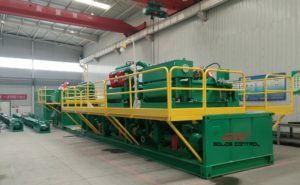 The jet mud mixer is a combination of mixing hopper, mixing pump, pipelines, valves, electric control panel and all mounted on the same 3 runners oilfield skid. It connects with the mud tank, and can mix the drilling fluids from any compartment of the mud tank. 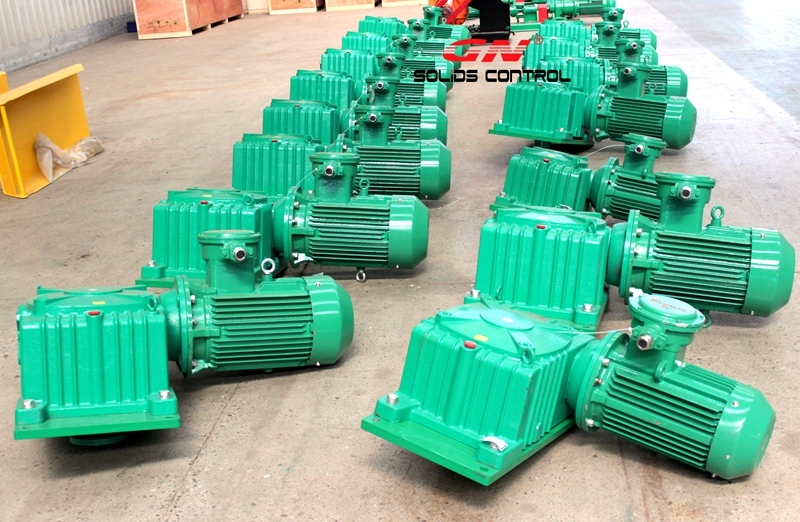 The electric motor and control system are all IEC EX with international explosion proof certificate, and the cables, glands are all comply with Australia standard. 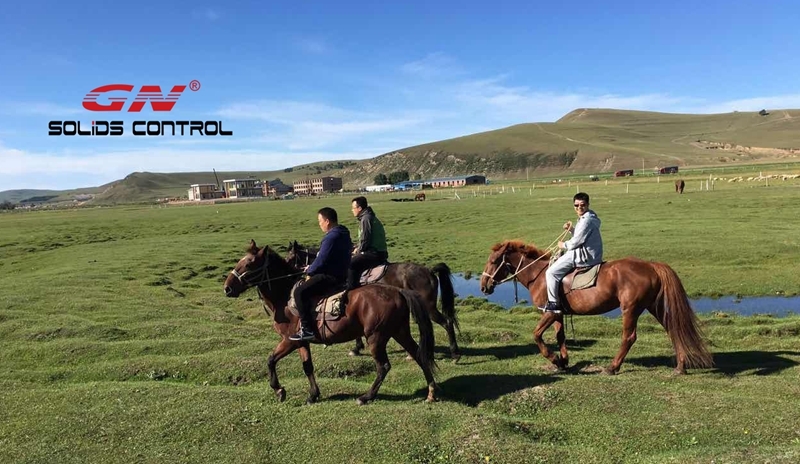 This weekend GN solids control go team traveling at the end of Summer in the Fengning grassland, all the employees in China right now participate in the traveling, some of the employees are still working aboard for installation, commissioning and sales in the branch company. All the department including international sales, domestic sales, technical dept. ,production dept., PMC dept., etc for both headquarter and the second facility. 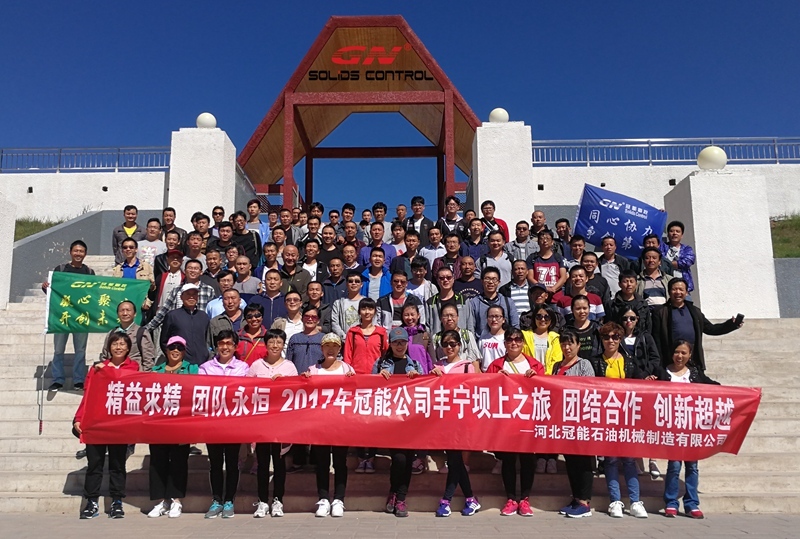 This is not the frist time for team traveling organized by GN solids control, every year GN solids control teams will go traveling in domestic and abroad. At end of March, GN international and domestic sales dept. go traveling in Thailand because of hard working and good sales. Even though the international crude oil price lower down a lot during the 2 years, all the projects goes very slow or cancelled, the main sales including oil & gas drilling solids control system, drilling waste management system, oil sludge separation system for refinery oil tank bottom cleaning, HDD and CBM mud recycling system, bored piling desander unit, shaker screens, shale shaker, decanter centrifuge, vertical cuttings dryer, mud cleaner, centrifugal pump, mud agitator, mixing hopper, mud tank system. 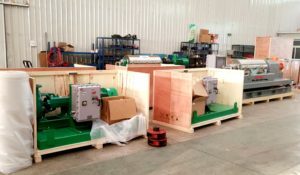 This month we just shipped several sets of mud tank system to our international client and domestic client, to ship the order in time as per the agreed delivery time, our workers have been working by 2 shifts and keep working without holiday, so the company decided to organize the team traveling after the big projects are shipped out to let the employees take a rest. Shaker screens sales amount increased a lot this year, especially for composite material frame shaker screens. 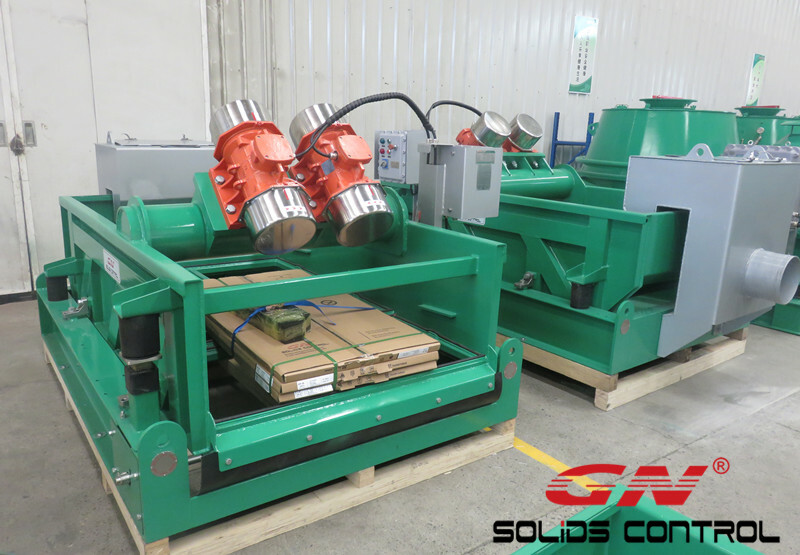 After testing the shaker screen samples, the clients repeat order for replacement shaker screens for SWACO Mongoose shale shaker. Welcome to send us inquiry if you have any requirement. 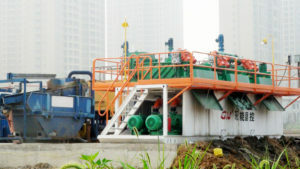 GN solids control designed and produced slurry separation system has been used for traditional oil & gas drilling solids control system and HDD & CBM, water well drilling, it has been also used for dredging slurry separation, TBM slurry separation, bored piling, liquid mud plant, core drilling solids removal unit, industry waste water treatment. 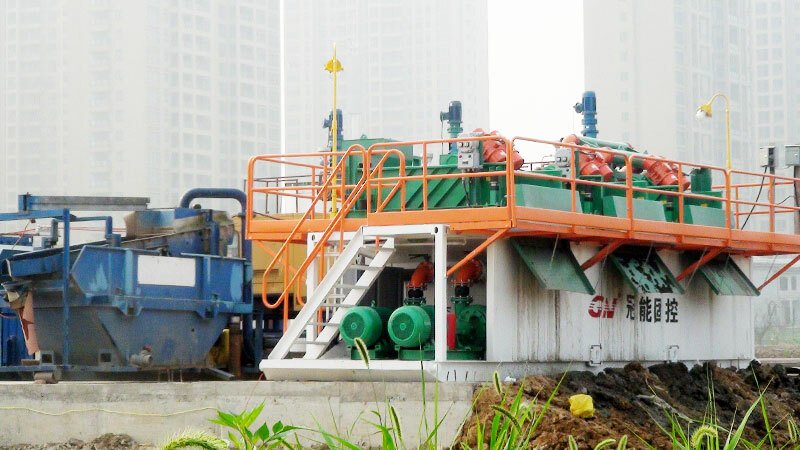 Dredging slurry separation system is usually used together with dewatering unit with dewatering centrifuge, GNLW363CG-VFD, GNLW453C-VFD , GNLW553C-VFD decanter centrifuges are the most common models used for dewatering unit. 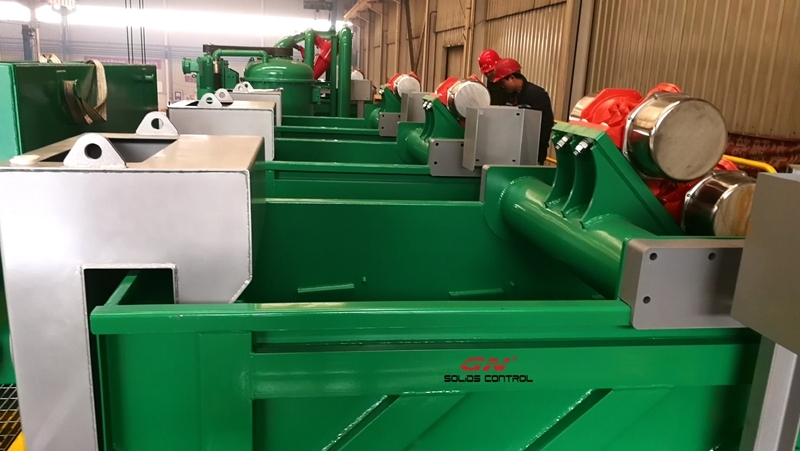 1) Filter screen to separate big stones, solids before feeding to our slurry separation system, to protect the first phase cleaning shaker screens, so the working life of shaker screen could be longer. 2) Use submersible slurry pump to feed to the shale shaker with coarse mesh shaker screen, to reduce the solids content, separate the big solids, the cut point is API40 @ 420 microns. 4) Desilter cone 4 inch as the third phase cleaning equipments to separate solids up to 20 microns, centrifugal pump works as desilter cone feeding pump. 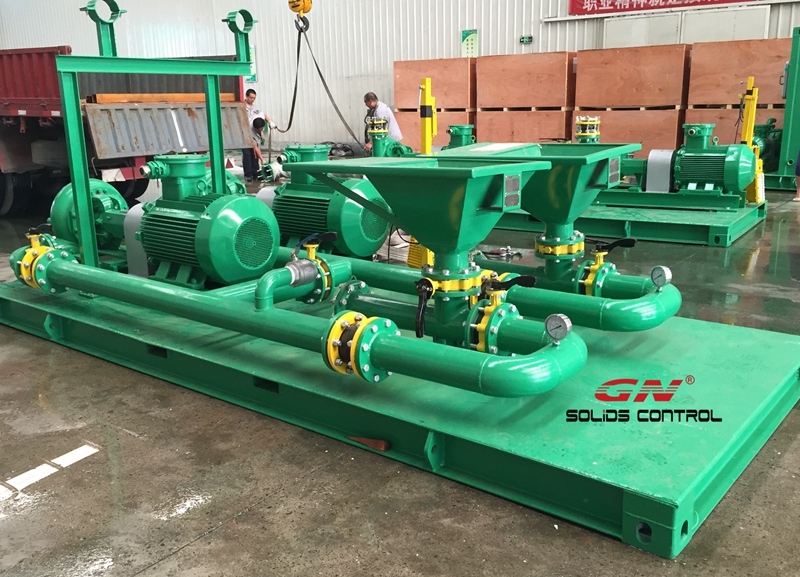 GN solids control is one of the leading manufacturer for industry solids-water separation unit in the world, our mud recycling system/ water recycling system has been sold to over 60 countries in the world. 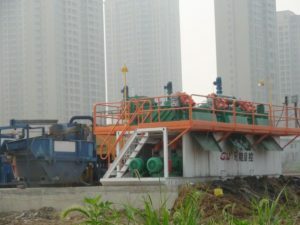 Dredging slurry separation unit is one of our main products for environmental service, we also produce desander unit for pilings, water recycling system for TBM or pipe jacking machine, mud cleaning system for HDD and water well drilling, our solids control equipments and system are also used for oil & gas drilling applications. Firstly received the sludge from the dredger which is mixed the water, stones, rubbish and fine solids and transfer the sludge from the dredge boat to GN dredging slurry separation unit by pump. We will use coarse mesh screens( polyurethane shaker screens for longer working life, especially suitable to separate big solids like stones, bricks, tree branch,etc) to separate big solids firstly, the purpose is to protect the equipments in the further process and improve the efficiency of the complete system. 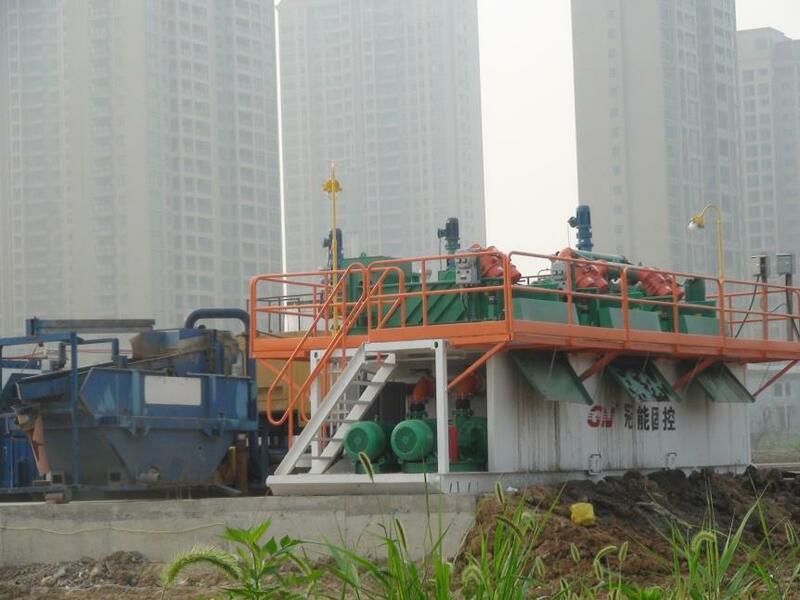 We will use multi shale shakers because most of the dredging projects need a very big treating capacity. 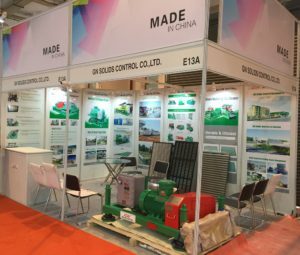 In the second step we will use fine mesh screen to separate fine solids, sometimes we will use desander cone and desilter cone with centrifugal pumps as feeding pump, but the cones are only as option, because of the high power consumption. 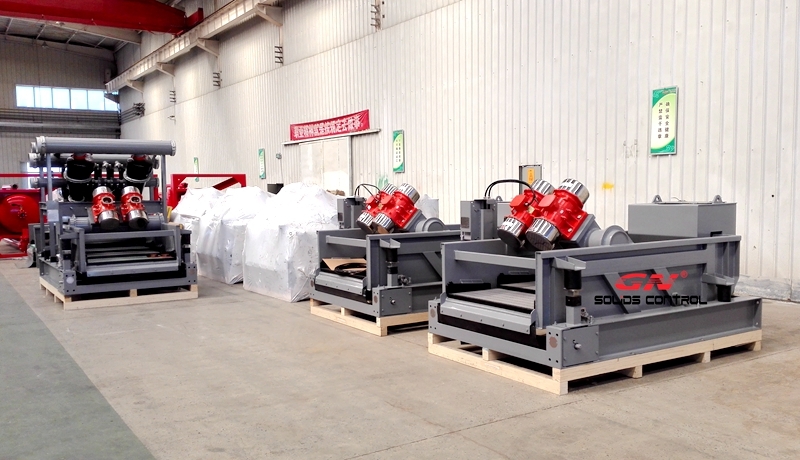 Recently we shipped 2 sets of linear motion shale shaker and 1 set of linear motion mud cleaner to Middle East. 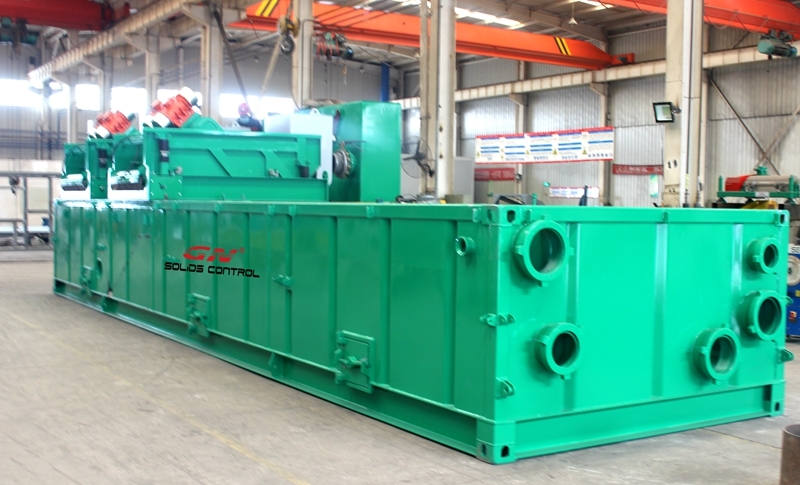 This is a 2 mud tank system, one mud tank is with only one unit of linear motion shale shaker, the other tank is with 1 unit of linear motion shale shaker and 1 unit of linear motion mud cleaner. The processing rate of the system is 500gpm. This is not our standard design, this is customized design for the slow oil industry client. 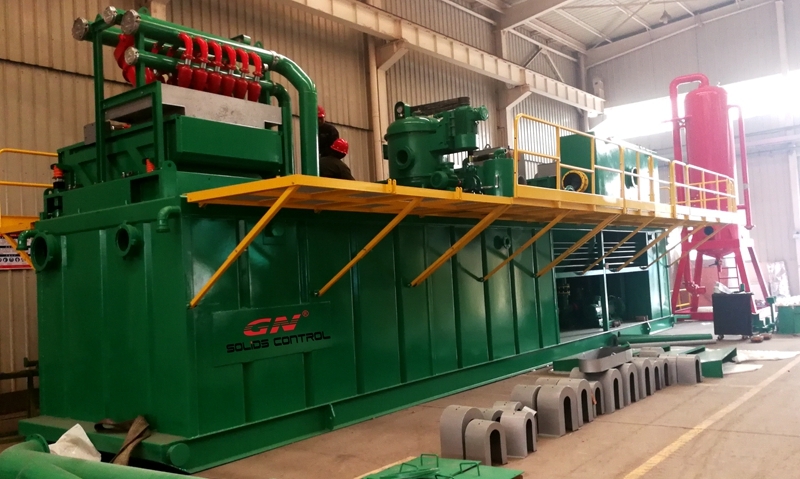 GN mud recycling system/ solids control system can be applied for all kinds of drilling when you need to clean and reuse the drilling mud. We are the drilling fluids cleaning and disposal specialist for water based mud, oil based mud and synthetic based mud. 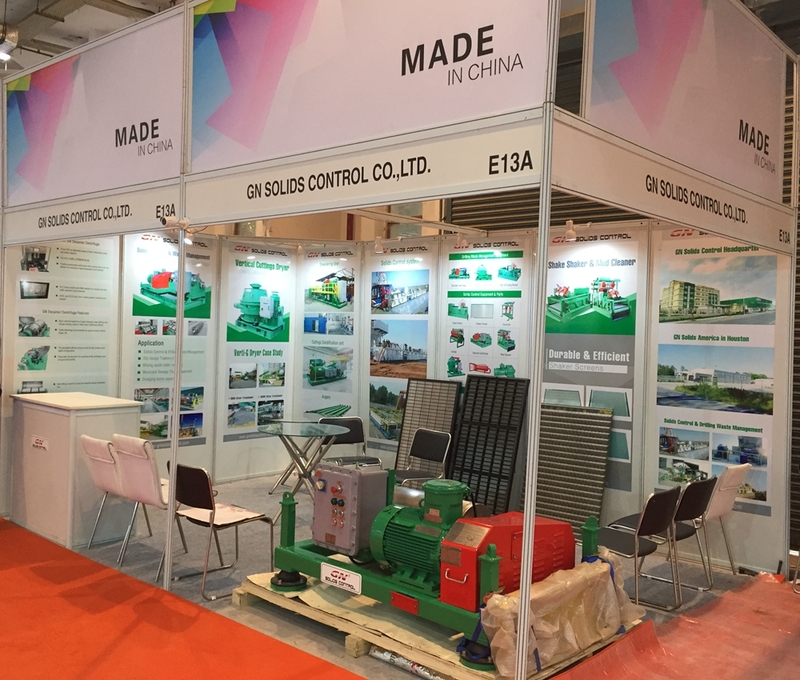 We have supplied solids control equipments, drilling waste management equipments and mud recycling system to middle east clients in the past years. Sometimes they will buy the equipments from us only, and make the mud tank locally to save freight cost. 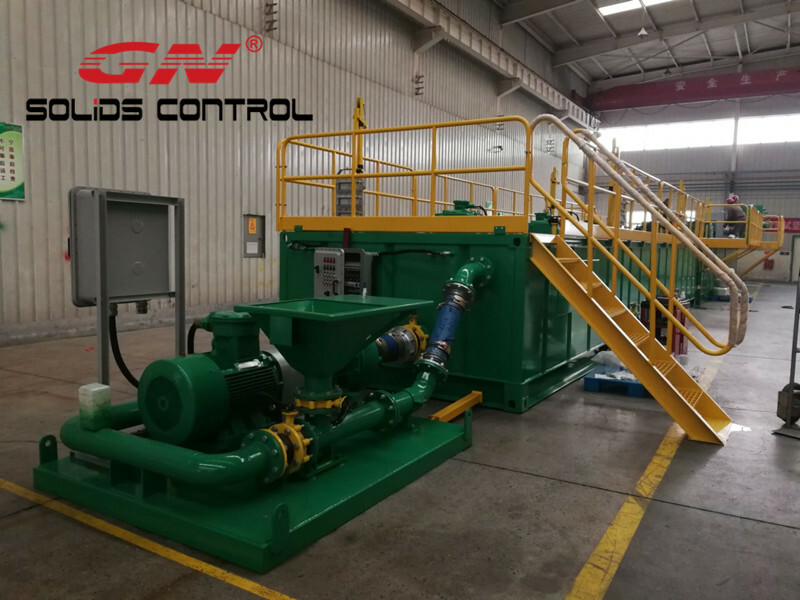 Some clients need a mud system easily movement, they will buy the skid mounted mud tank from GN, and installed in on their own trailer, together with the other components, for example, generator, pipelines, transfer pumps. The second mud tank with a centrifugal pump as transfer pump,The first mud tank with 3 sets of centrifugal pump, 2 of them as feeding pump of the desander cone and desilter cone, 1 as the mixing pump with the mixing hopper unit and shearing unit. 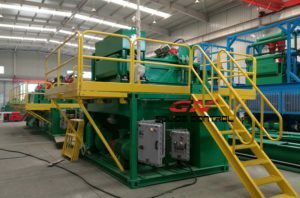 If you need a mud recycling system for water well drilling/ water injection well drilling, geothermal well drilling, diamond core drilling, Coal bed methane drilling, Horizontal directional drilling, shallow oil & gas drilling, deep water drilling, deep oil drilling, pilings, Tunneling, construction work, etc, pls contact with GN solids control.